George V. Eleftheriades is a recognized international authority and pioneer in the area of negative-refractive-index metamaterials. Dr. Eleftheriades is a professor and Canada Research Chair in the department of electrical and computer engineering at the University of Toronto. Together with his graduate students, Dr. Eleftheriades provided the first experimental evidence of imaging beyond the diffraction limit and pioneered several novel microwave components and antennas using these transmission-line based metamaterials. His research has clearly impacted the field by demonstrating the unique refractive properties of metamaterials; used in lenses and other microwave components used to drive innovation in fields such as defense, medical imaging, microscopy, automotive radar and wireless telecommunications. 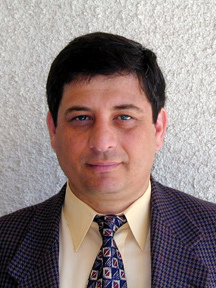 An IEEE Fellow, Dr. Eleftheraides is a distinguished lecturer for the IEEE Antennas and Propagation Society and has authored or co-authored over 200 published papers. He has received numerous awards for his work, including the E.W.R. Steacie Fellowship from the Natural Sciences and Engineering Research Council of Canada in 2004. This page was last edited on 26 January 2016, at 16:42.